winning the war? you know, sometimes when you win you lose... Initially this was going to be a 1860s Union Flag. 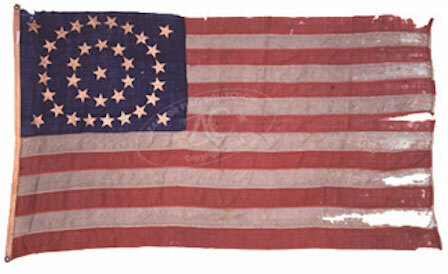 It's always been strange to me that you see so much Confederate paraphernalia but rarely a 'Union' flag. Sort of the story of America in a way -- lose war, blame someone else, declare victory, go home, gripe, repeat. How did we get here?!?!?! I really don't have the answer ... before my time and concern. Important to learn from past, repeat the good stuff ... avoid doing the things that fractures reality into endless dramas. all really means. Hysterical in the grand scheme of the Universes. Drama. Good point, all though drama is in many ways the reality we all live, even vicariously much of the time. Isn't this all just one big cosmic play, comedy, tragedy, joke!? reminds me of a peacock feather. I like the colors a lot. Fish birds wings fins etc. but mostly eyeballs. EYEBALLS! I like the colours and the way you broke the pattern. Looks like frozen Aurora. Yes it is. I just added some descriptive info.